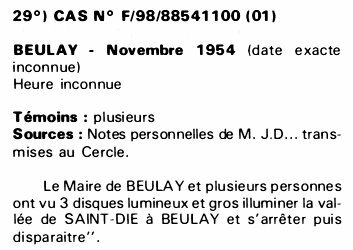 Reference number for this case: Nov-54-Beulay. Thank you for including this reference number in any correspondence with me regarding this case. F. Diolez of the ufology group CNEGU noted in their catalog in 1986 a case in Beulay in November 1954, of exact date unknown, time unknown, having several witnesses, found in personal notes "of Mr. J. D ... transmitted to the Circle." These notes say that the Mayor of Beulay and several people have seen three large bright discs illuminate the valley of Saint-Die in Beulay and stop and disappear. Above: CNEGU found its case F/98/885411(01) of Beulay in November 1954, at an unknown exact date, unknown hour, having several witnesses, in personal notes "by Mr. J.D... transmitted to the Circle." CNEGU indicates that these notes say that the Mayor of Beulay and several people saw three luminous and large discs illuminating the valley of Saint-Dié to Beulay and to stop then disappear. The information is much to meager for an assessment; it could have been some misinterpretation of headlights, for example. [cn1] "Catalogue Rétroactif 1954 des Cas Vosgiens - 3 Suite et Fin", compiled by F. Diolez of the ufology group CNEGU, in the ufology magazine Lumières Dans la Nuit (LDLN), France, #265-266, page 42, July / August 1986. 1.0 Patrick Gross December 21, 2008 Conversion from HTML to XHTML Strict. First formal version. Additions [jd1], [lc1], [ud1], [ud2]. 1.1 Patrick Gross December 6, 2018 Addition of the Summary. Explanations changed, were "Not looked for yet."